Abstract: Specialized Schools for High-Ability Learners focuses on educational programming offered in nontraditional, publicly approved, and private settings, with important details about how to serve high-ability learners in specialized schools and deliver schoolwide educational change. 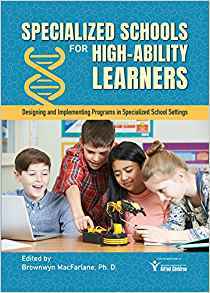 Each chapter offers a differentiated resource for educators who are interested in designing and implementing programs in specialized school settings by providing a discussion of the critical components for inclusion in a carefully planned, coherent, and quality-minded K-12 curricular sequence. This book delivers a comprehensive discussion with recommendations for the learning experiences of high-talent students in specialized schools and alternatively approved educational programs.